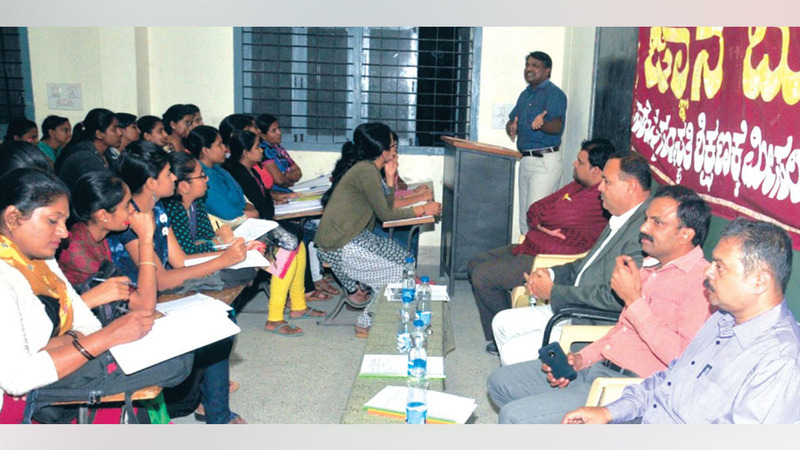 Mysuru: City Police Commissioner Dr. A. Subramanyeswara Rao has said that success can be achieved only if one comes out of mental stress and dilemma. He was addressing the civil service competitive exam aspirants taking part in coaching classes organised by Jnanabuthi at Government High School and Pre-University College, Lakshmipuram, JLB road in the city recently. Recalling that earlier, there were a few platforms to exchange information, Dr. Rao said that the times have changed completely now wherein we can get any sort of information on our finger tips. Pointing out that dedication, determination and concentration hold key for success in competitive exams, he said that this was an era of cut-throat competition and as such, every aspirant should equip himself / herself to successfully meet all the challenges that come in their way. Noting that confidence is vital in facing competitive exams, the Police Commissioner wished the aspirants success in the exams. MCC Commissioner K.H. Jagadeesha in his address, said that it was important for the aspirants to have an integrated knowledge of all subjects. He also called upon the aspirants to focus more on current affairs, general knowledge, prevalent issues etc., as it would largely help them in their exams. Vidyavardhaka Engineering College faculty Dr. M.A. Sriram, Mandya PES College faculty Dr. G.V. Narasimham, Y.N. Shankaregowda, Jainahalli Sathyanarayanagowda, H. Balakrishna and others were present.